Happy Tuesday friends! I just got back from a fun weekend with the family in Lake Arrowhead. The kids had a blast playing in the snow, sledding and having snow ball fights. Now I’m ready to move past winter and look towards Spring! One of my favorite NEW trends this Spring is the color yellow. It makes me think of sunshine and happiness and there’s nothing better than that! Spring means warmer temps and less layers. Time to show a little shoulder!! 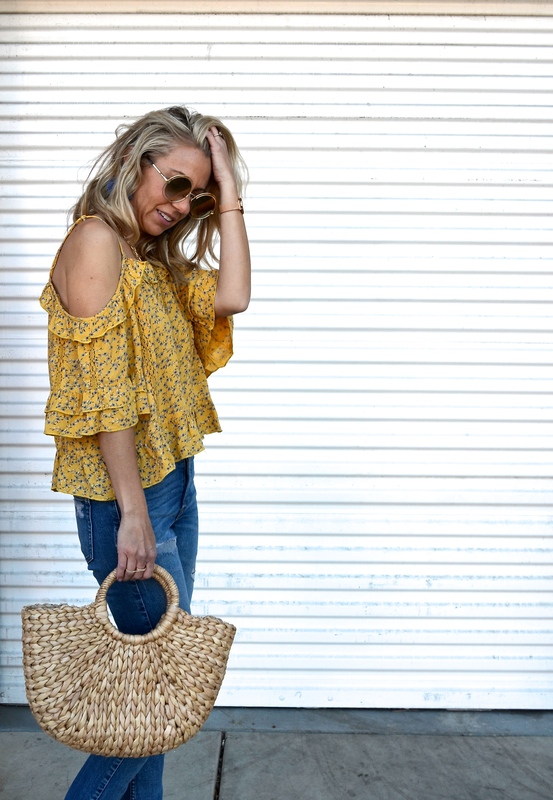 This cute floral top is from American Eagle and I love the delicate ruffles. It’s the perfect transition piece! All you need to do is swap out your winter sweater with this cute top and you’re all set for Spring! 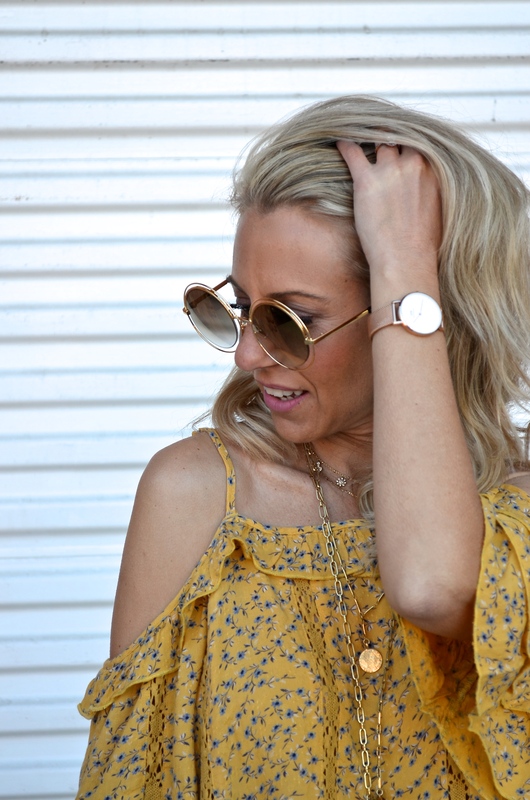 I styled this yellow top with my Stella & Dot coin layered necklace and statement earrings. And of course it’s time to bring out my favorite straw bag. Straw bags were such a big trend last year and they’re back again! I got these cute bohemian style sunglasses from Dualen’s and my watch is the new rose gold Daniel Wellington. You can get 15% off your own watch HERE with using code 15JACLYN at checkout. This cute floral top is the perfect way to start slow with the yellow trend. I love yellow so much right now and can’t wait to wear it more! What do you think of the color yellow? How would you style it for Spring? Here’s more cute looks I found with this FUN yellow trend. Loving the yellow trend! It really is such a fun and happy color. I would definitely style yellow with some jeans and sneakers.. my two faves! Thanks for sharing this cute look girl.